The two broccoli heads nicely aging in the refrigerator drawer were meant for a recipe other than the Parmesan Roasted Broccoli. The broccoli was supposed to make a kind of pesto that I would make with chicken. Well, time passed and the poor broccoli was reaching middle age — not good for the nutritional value or the appearance. Instead of the original recipe, the recipe that I ended up with was extremely flavorful with lemon and garlic, easy to prepare and very satisfactory. I wanted to come up with a tasty way to use up the broccoli and lemon kept popping in my mind. . . a delicious lemon sauce. I was craving the taste of lemon but, to be totally honest, I needed to use up a lemon that was metamorphosing into a bocce ball. . . .I wanted EASY! It was time to search the cookbooks. I didn’t want to simmer it in salted water. It now seemed that my only choice was either raw or roasted. Now, I’ve eaten my share of raw broccoli throughout the years, but it was usually as an appetizer with a dip, or as a tummy filler when I was dieting and I was staaarving! I had eliminated everything else and now all that was left was Plan C — roasted broccoli. As I paged through the cookbooks I found an interesting broccoli recipe by Ina Gartin in her cookbook Back to Basics. The roasted broccoli recipe sounded as if were tailor-made for this Italian family. It used extra-virgin olive oil to coat the broccoli. What self-respecting Italian wouldn’t be happy that a touch of garlic? Parmesan cheese added additional flavor to the dish. 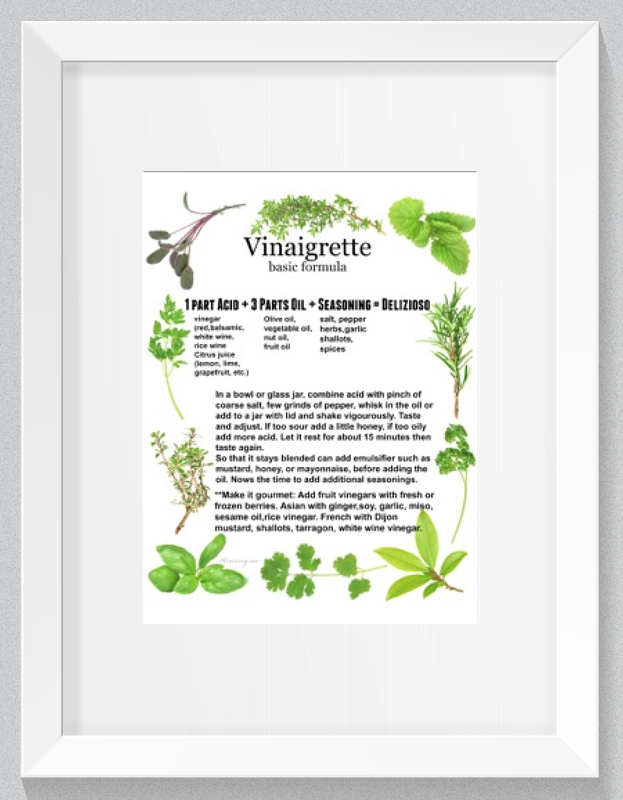 Basil was included — I had an abundance (an understatement) of the herb! The fate of the lemon was sealed. We’d add it to the roasted broccoli as zest and a zing of fresh lemon juice. Perfetto! The recipe called for toasted pine nuts but I used the extra roasted sunflower seeds I’d bought for our Italian Summer Salad with Basil Dressing. Ecco!! Parmesan Roasted Broccoli was it. Era delizioso ( it was delicious). Un caro saluto e ala prossima. An easy and healthy way to prepare broccoli. It is tossed with olive oil and then roasted with garlic. 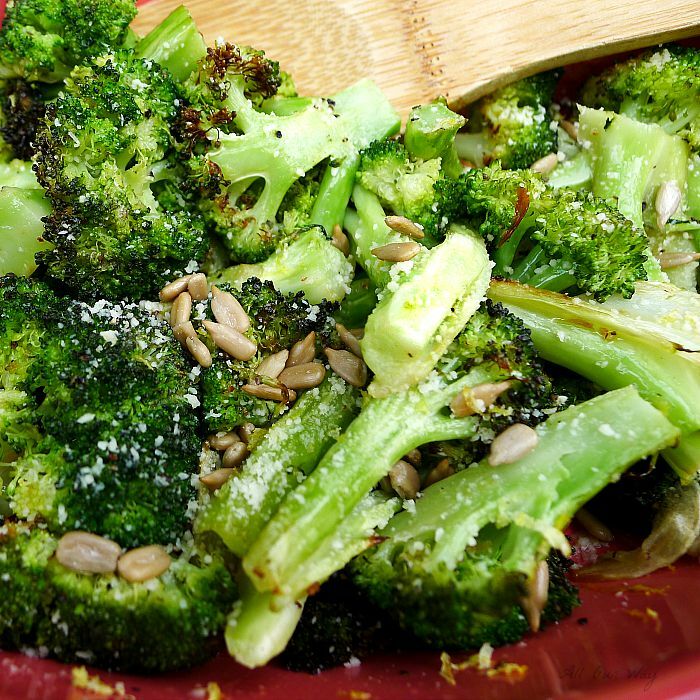 The roasted broccoli is finished with Parmesan cheese, fresh lemon juice and zest with a sprinkle of sunflower seeds. Wash the broccoli and cut the broccoli florets from the thick stalk, leaving some of the stalk attached. Pull the florets apart. You don't want too small of pieces. Place the broccoli florets on a foil lined sheet pan large enough to hold them all in a single layer. Toss the garlic on the broccoli and drizzle with about 5 tablespoons olive oil. Sprinkle with the salt and red pepper flakes. Roast for 20 to 25 minutes, until crisp-tender and the tips of some of the florets are browned. Remove the broccoli from the oven and immediately toss with 1 1/2 tablespoons olive oi, the lemon zest, lemon juice, sunflower seeds, Parmesan, and basil. Adapted from Ina Garten's Back to Basics recipe. Note: Recipes and content from ©All Our Way is copyright protected. Please do to use content or recipe without prior written permission. If you want to share the information please link to this post. Grazie. I really love broccoli. I know many people don’t but this is like perfection to me. Broccoli paired with parmigiano cheese … just one big YUM! Love the addition of sunflower seeds. I seriously eat roasted broccoli like crazy! This recipe is seriously speaking my language. Yum!!! This broccoli sounds delicious, but when garlic is involved how can it not be? I think this will be on my table real soon! I love broccoli but I always have it steamed as a side – not very exciting! This sounds absolutely delicious though, simple but full of my favourite flavours. I’m going to have to try it! Hi, Elizabeth! You won’t be disappointed. Love how easy this recipe looks! My family will love it! Thanks for sharing! I have stories of vegetables dying a slow death in the fridge quite often. That’s why I love easy recipes like this that will use up those. I love all the flavors here and definitely be trying them! Roasting is my favorite way to enjoy vegetables. It adds so much flavor that you simply cannot achieve from frying or boiling. These look like the perfect balance of flavors, umami if you will. Thanks for sharing. Sounds delicious, I can’t wait to try the recipe! I love making asparagus with Parmesan. Don’t know why I didn’t think to use it to flavor broccoli! Broccoli and Parmesan are the perfect combo. So delicious! Thanks for the recipe. Never roasted broccoli before. Sounds yummy! This is going to be on my menu this coming weekend. I love how simple and easy this is Marisa. Love that you added sunflowers seeds. I’m saving this for later. Broccoli is a family favorite in our home and everybody is always surprised how my kids enjoy broccoli without loading it with cheese. I usually add a sprinkle of Parmesan as well. Gives such a nice nutty flavor. This looks so good Marisa. I’m going to have to try it soon. LOL it’s like you read my mind! We always have broccoli but we usually just steam it. Now this would be a welcome change. Can’t wait to mix things up! My family loves broccoli and this will be a nice change from just the plain old broccoli dish I make. Thanks for the recipe! Wow, this recipe hits right on the spot! I am obsessed with broccoli, parmesan, basil, lemon and sunflower seeds.. What an excellent combination! I loved your story of how you saved the broccoli from dying a slow death in your fridge! Happens to me more often than I care to admit! This is an easy way to have your greens and enjoy them too! I love roasting veggies. In fact, unless I am grilling them I roast them (except for mashed potatoes). These sound delicious and would be the perfect side to so many proteins. A great side dish all year long. My whole family loves broccoli, even the grandkids. They also love parmesan cheese too. Broccoli is everything I need at the moment. I doubt there is any other veggie that I appreciate so much. Its taste, its healthy qualities, its shape – everything looks perfect to me. And when I stumble upon a recipe like your parmesan roasted broccoli, I save it. Because I do want to enjoy my two broccoli heads (or four – just need to check the fridge first). Thank you! YES to easy recipes!!! There is nothing I love more than an easy recipe that is loaded with flavour! The addition of the lemon for the citrus burst is delicious, and anything topped with seeds/nuts is a sure thing for me. My whole family loves broccoli. I know they would love this. Looking forward to giving this recipe a try. I sure do love broccoli and this sounds delicious! Thanks for sharing the recipe, I’m always looking for new recipes to eat more vegetables! 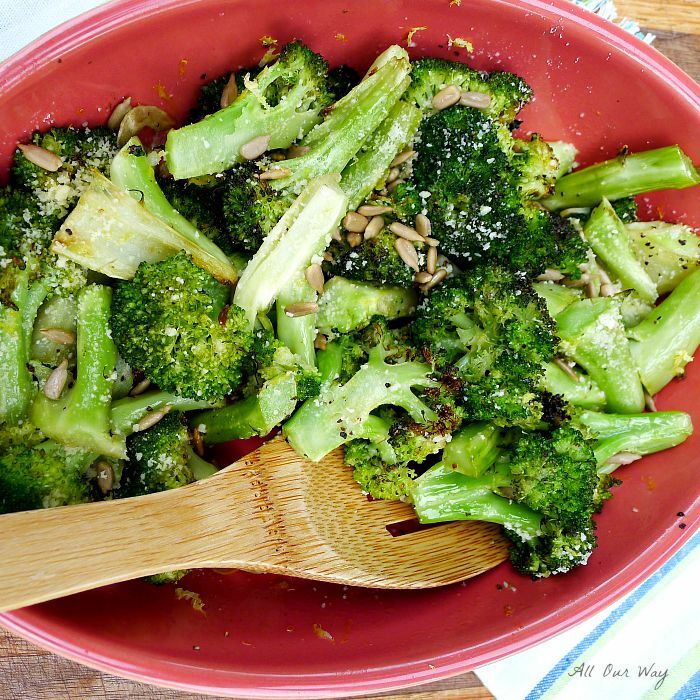 This easy and one pan Parmesan Roasted Broccoli recipe is perfect for holiday meals. With a house full of people, this is a great side to fill bellies! This looks so good. I love the addition of the sunflower seeds! 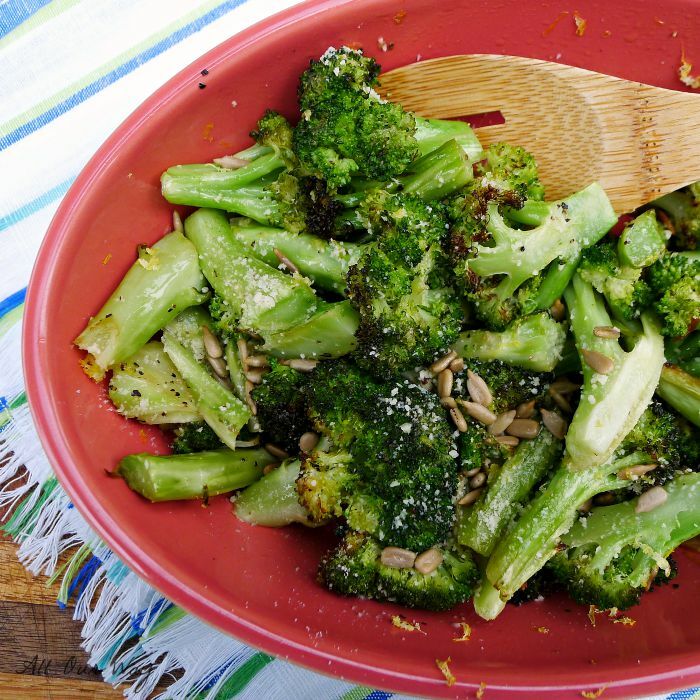 I bet the nutty crunch is so yummy with the roasted broccoli- beautiful side dish!